Should you be deft enough to take a Castle, you’ll now be responsible for managing it. Castles will have their own Nodes associated with them, and developing and defending those Nodes will determine the state of your Castle during the next siege. If you’ve done a good job managing your kingdom, then you’ll have more and better options available for deployment during the next siege. If you let your populace fall to ruin, you may have to rely solely on your own devices. Guild castles have three adjacent nodes in close proximity. Castle nodes exist outside of the node system. They are independent of anything that's happening outside in the world with other nodes shutting off certain nodes from progressing. Castle nodes do not have Citizenship, Zones of Influence, Freeholds, Node governments, or Social organizations. Castle nodes cannot exceed stage 3 (Village). Castle nodes are always military node types. Each of the dedicated castle nodes is barren at the start of the castle ownership period. The guild must develop those nodes to enhance the defenses of the castle. Castle nodes are leveled through questing by the owning guild or alliance guilds. Levelling castle nodes is a hastened process compared to regular nodes. Using caravans to move supplies during the weeks before a castle siege. Completing these quests unlocks services and functions that are useful to the occupying guild and its allies as well as boosting the defenses the castle. 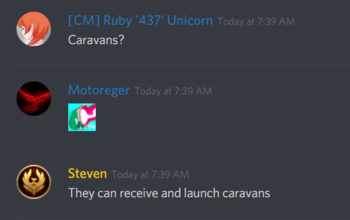 Rival guilds will want to destroy supply caravans to prevent them from leveling up the castle and its dedicated nodes. Being a member of the occupying guild automatically makes you a garrison of the castle nodes and castle itself. Only members of the occupying guild are citizens of these nodes. This citizenship is different to normal node citizenship. Castle nodes don't operate like normal nodes. Guilds will be able to sign up to either siege or defend a castle. Players don't need to be in the guild that owns a castle in order to sign up for the defense of the castle. The guild leader that owns the castle is able to approve guilds that have applied to defend at the castle. Guilds that wish to siege the castle will be required utilize masters of each artisan class: Gathering, Processing and Crafting in order to create a declaration flag. Following declaration, the defender has a week grace period to approve defenders, hire mercenary NPCs and set up defensible positions. As a Siege rages on, there is a sense of territory and progression through the battle. These are represented through Control Points, and each side starts with a few already owned. Others are present, but neutral. As Control Points are captured by one side, that side gains a temporary buff and an increase to their spawn rate. The other side will find that their spawn rate has decreased and their ultimate victory condition has been pushed just a little bit further from their reach. The spawn areas also have a portal which will allow the side that owns it to teleport to any Control Point that side owns - perfect for backdoor shenanigans. Attackers capture waypoints in the castle's architecture to diminish their respawn timer and increase the respawn timer of the defenders. Defenders can counter-play by attacking the siege headquarters of the attackers to diminish their declaration flags and increase their respawn timers. 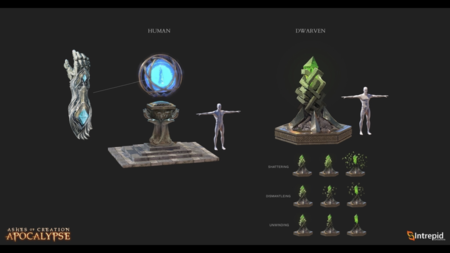 Legendary NPCs will be present as commanders that act mini raid boss within the defending and attacking armies. Killing these provides added benefits, such as certain types of drops that grant battlefield benefits to either side. The ultimate objective for the defenders is to survive during the timed period of the siege, which is approximately 90 minutes in its first iteration. If the attackers reach the inner keep of the castle, a guild leader (or one other delegated officer) must cast a 3 to 5 minute cast to seal ownership of the castle. Casting time is diminished based on on the number of waypoints captured during the siege. There's an opportunity for any guild leader in the attacking alliance to capture the castle for themselves, despite what may have been agreed upon prior to the siege. When a siege begins, temporary alliances are formed among attackers and defenders. For node sieges, citizens of the node or provincial nodes being attacked are automatically registered as defenders. There are many reasons to participate as an ally in the attack or defence of other nodes. A siege occurs over several phases. Certain siege mechanics may be gated for specific size groups during sieges. There will not be a deserter debuff for leaving a siege before it is complete. More will be revealed in an upcoming blog entry. 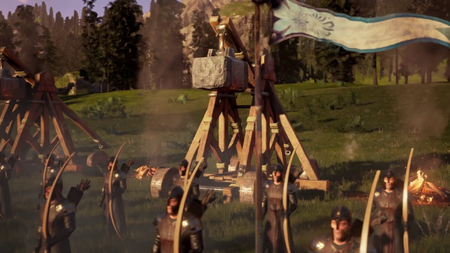 It wouldn’t be a castle siege without siege weapons. These are massive machines of war that enable attackers to bring down the walls, and defenders to keep their keep safe. Crafters can bring their own powerful schematics to the battlefield, or you can order baseline siege weapons from your friendly neighborhood siege master NPC. 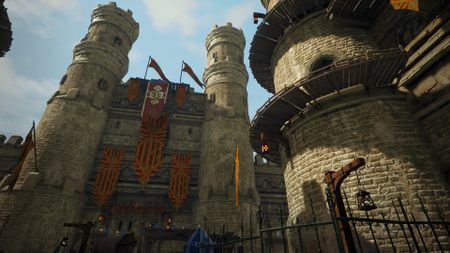 The Castle’s defenders will be able to deploy their own defensive weapons and turrets based on how well they maintained and defended their own Nodes. The sky will be illuminated with fire and fury. Siege weapons are able to be crafted or purchased from NPCs. Siege equipment will require materials, recipes and craftsmanship. Sieges don't use the PvP flagging system. NPCs serve as defense points. Killing them allows the attackers to gain advantages during a siege. NPC's are only killable during a siege and will respawn if the siege is unsuccessful. 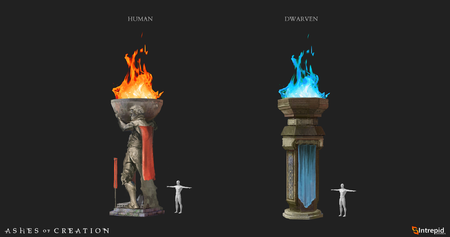 NPC guards are intended to be a significant presence but not the main line of defense in a siege. We’re working on a destruction engine that should help us to make a Castle Siege that feels cinematic and visceral. Having shards of the walls tumble to the ground after a trebuchet scores a hit will feel satisfying in a way no other Castle Siege has been able to offer in an MMORPG like this. Maybe you don’t need to take down the whole wall, maybe if you blow open a big enough hole, that’ll be enough to turn the tides. Rubble will be visible for a period of time following a successful castle siege. This will likely persist until the incumbent guild develops the first defensive node. Ashes of Creation Apocalypse castle sieges map preview. 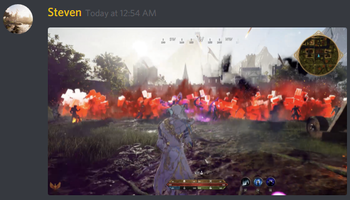 Ashes of Creation Apocalypse castle sieges take place on a 1km2 (one square kilometer) map. 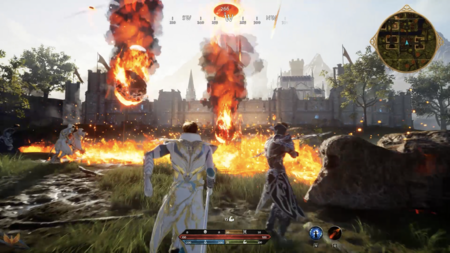 Five castles are intended for the Ashes of Creation MMORPG. It's likely that eventually there will also be five castle maps on Ashes of Creation Apocalypse castle sieges. 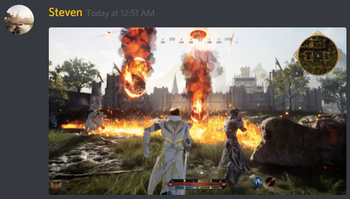 Initially two castle maps are planned for Ashes of Creation Apocalypse castle sieges. A Dünzenkell castle named Milnar. This castle is built into a cliff face. It has sturdy walls and underground tunnels. An Aelan castle named Korgan . 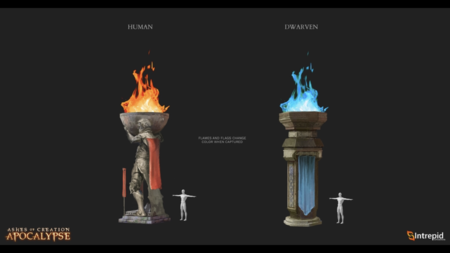 Dünzenkell Dwarven and Alean Human objective torches. Ashes of Creation Apocalypse castle siege objective torch. The bowl fills with flames colored to match the team that captures the objective. 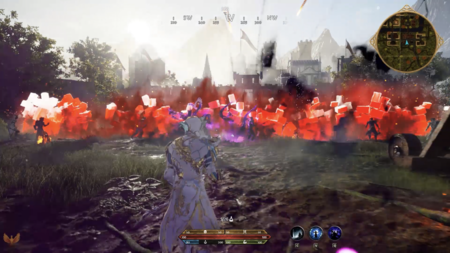 Ashes of Creation Apocalypse castle sieges will be objective-based. A player elects to be either an attacker or defender. The matchmaker will attempt to assign a player their selected side (referred to as role in the article) but it may allocate another side so as to shorten queue times. Once in the match, a player's side will not change. Players select one of the six classes prior to battle. Players can see the numbers of players in their raid who have selected each class. Players will have a limited amount of time to lock in their class choice. If they miss the window, the least selected class choice will be automatically chosen for them. There is no limit to the number of a specific class that may be on a team, however the developers note that composition will be important from a strategic perspective. Classes cannot be swapped during a match, but this may change based on testing. There will be a timeframe for preparation where attackers and defenders take positions and prepare weaponry. 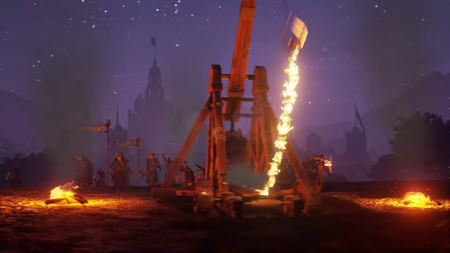 Siege weaponry will include ballistas, trebuchets, battering rams and potentially traps and "powder keg" type weapons. In the first phase of battle the attackers attempt to penetrate the walls and gates to gain access to the inside of the castle. Once inside the castle, the attackers need to hold objectives. There are objectives within the castle, such as killing guard captains. Attackers must destroy key strategic objectives to swing the battle in their favor. Defenders must protect key strategic objectives to maintain advantage. Holding capture points increase or decrease the duration of the map, change the opposing side's respawn times and give buffs to the side that holds them. Players can also respawn on capture points that they hold. The ultimate objective of the attackers is to reach the center keep of the castle to channel on the final relic that's present in order to achieve victory. The defenders are attempting to hold out as long as possible, but they can also rush the field to the enemy encampment or headquarters to attempt to damage their ability to siege. Attempt to take out attacker's siege weapons. Attempt to capture attacker's control points to increase their spawn time and decrease the total match time. Players have infinite lives in castle siege mode. Upon death, players join a respawn queue shared with their teammates. ↑ 1.0 1.1 1.2 1.3 1.4 1.5 1.6 1.7 Blog: 10 facts about castle sieges in the MMORPG. ↑ 5.0 5.1 5.2 5.3 5.4 5.5 5.6 Podcast, 23 April 2018 (21:55). ↑ 6.0 6.1 Livestream, 23 August 2017 (23:00). ↑ 7.00 7.01 7.02 7.03 7.04 7.05 7.06 7.07 7.08 7.09 7.10 7.11 7.12 7.13 7.14 7.15 7.16 Podcast, 23 April 2018 (15:14). ↑ Video, 20 April 2017 (8:20). ↑ 12.0 12.1 12.2 12.3 12.4 Livestream, 4 May 2018 (48:14). ↑ 13.0 13.1 13.2 Interview, 17 August 2018 (24:48). ↑ 14.0 14.1 14.2 14.3 Interview, 11 May 2018 (44:20). ↑ Livestream, 24 May 2017 (37:05). ↑ Video, 31 May 2017 (2:27). ↑ 22.0 22.1 Livestream, 18 January 2018 (37:05). ↑ 23.0 23.1 Interview, 8 August 2018 (20:49). ↑ Livestream, 28 July 2017 (36:51). ↑ 30.0 30.1 30.2 Livestream, 8 April 2018 (PM) (51:49). ↑ 34.0 34.1 Livestream, 22 May 2017 (57:37). ↑ 36.0 36.1 36.2 36.3 Podcast, 11 May 2018 (49:20). ↑ Livestream, 19 May 2017 (10:06). ↑ 38.0 38.1 Livestream, 8 April 2018 (AM) (28:01). ↑ 39.0 39.1 Interview, 17 August 2018 (14:59). ↑ Livestream, 9 July 2018 (42:48). ↑ 44.0 44.1 44.2 44.3 44.4 Livestream, 17 August 2018 (30:29). ↑ 45.0 45.1 45.2 45.3 45.4 Livestream, 1 September 2018 (54:06). ↑ 46.00 46.01 46.02 46.03 46.04 46.05 46.06 46.07 46.08 46.09 46.10 46.11 46.12 46.13 46.14 46.15 46.16 46.17 46.18 46.19 46.20 46.21 46.22 Castle Siege Overview. ↑ Video, 11 January 2019 (0:00). ↑ 51.00 51.01 51.02 51.03 51.04 51.05 51.06 51.07 51.08 51.09 51.10 51.11 Livestream, 11 January 2019 (35:44). ↑ 52.0 52.1 Livestream, 11 January 2019 (34:26). ↑ Livestream, 11 January 2019 (56:11). ↑ 56.0 56.1 56.2 56.3 56.4 Livestream, 11 January 2019 (37:45).